Directions: Park on La Jolla Scenic Drive and walk down the main entrance to Scripps Institute of Oceanography. To the north of the pier is a ramp leading to the beach. Other options are to the south of the campus. 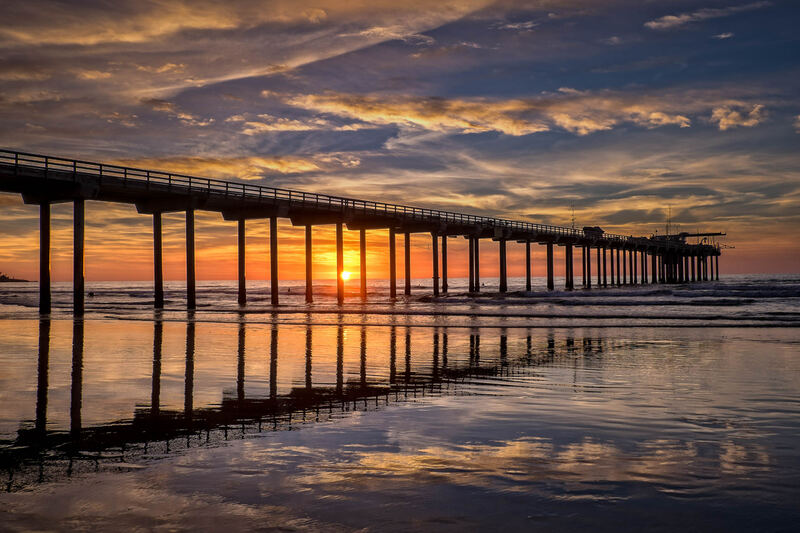 The Scripps Pier is photographers’ favorite in San Diego at sunset. The beach crowds have left and there is ample, free parking on the road with a short walk down to the beach. Sunsets can be random, though. My unique approach – and old surveyor’s aluminum tripod with a thread adapter (easily available) to convert from 5/8″ to 1/4″ ball head. Certainly heavier than a carbon fiber model, but easier to clean and I don’t worry about getting it in the ocean.